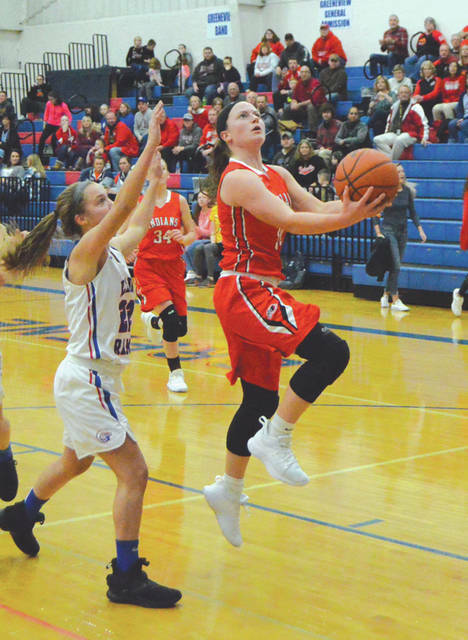 Greene County area schools Carroll, Cedarville and Legacy Christian Academy emerged as the top seeds from the county for the 2019 sectional basketball tournaments. Liz Bush (21) and Carroll are the No. 1 seed in Division II, while Emily Riddle (10) and Legacy Christian; and Maggie Coe and Cedarville are both No. 2 seeds in Division IV. 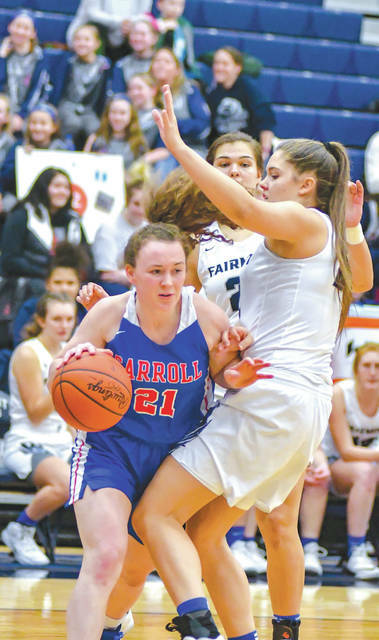 GREENE COUNTY —Five of the Greene County area’s nine girls high school basketball teams have earned tournament seedings of fourth or better, and the Carroll Patriots lead the way as the No. 1 seed in their Division II bracket, as the sectional pairings were announced earlier this week. Carroll is the top seed in the D-II Tecumseh 2 bracket and could make a deep postseason run. Division IV teams Cedarville and Legacy Christian Academy both earned No. 2 seeds in their respective brackets. Cedarville will play in the Monroe 1 bracket, while Legacy heads north for the Sidney 2 bracket. Bellbrook, Division II state semifinalist a season ago, is in as the No. 4 seed in the Lebanon 1 bracket. Beavercreek is the area’s best seeded team in Division I, also at No. 4. Greeneview is the sixth seed in Division III (in Covington), Yellow Springs is an eighth seed in Brookville, while Division I programs Fairborn and Xenia are nos. 14 and 18 respectively. 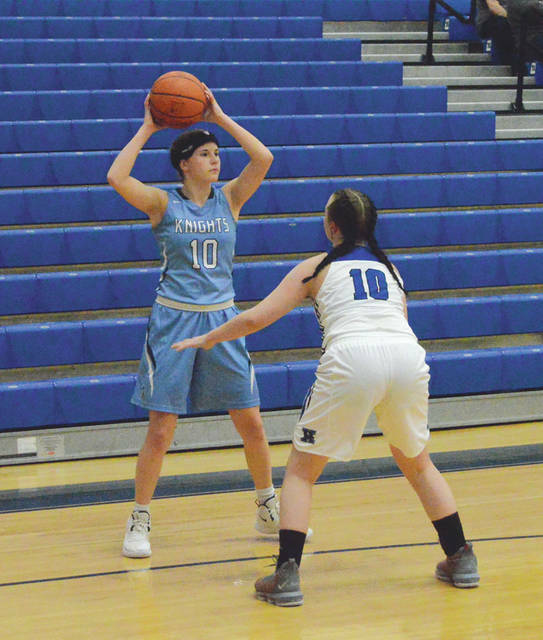 The 2019 girls high school basketball sectional tournament brackets, with seeding, school name and opponent. Greene County area teams are italicized. No. 10 Springfield vs. No. 11 Piqua, 2:30 p.m.
No. 4 Beavercreek vs. No. 12 Butler, 4 p.m.
No. 3 Fairmont vs. Springfield-Piqua winner, 6 p.m.
Troy-Northmont winner vs. Beavercreek-Butler winner, 7:30p.m. No. 1 Centerville vs. No. 16 Stebbins, 5:30 p.m.
No. 5 Springboro vs. No. 14 Fairborn, 7 p.m.
No. 19 Sidney vs. Centerville-Stebbins winner, 6 p.m.
No. 15 Edgewood vs. Springboro-Fairborn winner, 7:30 p.m.
No. 2 Wayne vs. No. 18 Xenia, 4:30 p.m.
No. 13 Miamisburg vs. No. 6 Tecumseh, 6 p.m.
No. 17 West Carrollton vs. Wayne-Xenia winner, 6 p.m.
No. 8 Lebanon vs. Miamisburg-Tecumseh winner, 7:30 p.m. Winner vs. Cincinnati 5 Bracket winner, Saturday, March 2, TBA at Princeton HS. No. 2 Valley View vs. No. 11 Madison, 6 p.m.
No. 8 Oakwood vs. No. 6 Alter, 7:30 p.m.
No. 4 Bellbrook vs. No. 10 Dunbar, 11 a.m.
No. 5 Monroe vs. Valley View-Madison winner, 6 p.m.
Oakwood-Alter winner vs. Bellbrook-Dunbar winner, 7:30 p.m.
No. 1 Carroll vs. No. 13 Meadowdale, 12:30 p.m.
No. 8 Eaton vs. No. 6 Ponitz, 2 p.m.
No. 7 Bellefontaine vs. No. 5 Greenville, 3:30 p.m.
No. 14 Belmont vs. Carroll-Meadowdale winner, 6 p.m.
Eaton-Ponitz winner vs. Bellefontaine-Greenville winner, 7:30 p.m. Winner vs. Cincinnati 1 Bracket winner, Friday, March 1, TBA at Mason HS. No. 6 Greeneview vs. No. 7 Arcanum, 6 p.m.
No. 12 Ben Logan vs. No. 11 National Trail, 7:30 p.m.
No. 13 Bethel vs. Greeneview-Arcanum winner, 6 p.m.
No. 1 Waynesville vs. Ben Logan-National Trail winner, 7:30p.m. Winner vs. Wilmington 1 Bracket winner, Saturday, March 2 TBA at Springfield HS. No. 7 Newton vs. No. 9 Miami Valley, 5:30 p.m.
No. 12 East Dayton Christian vs. No. 5 Catholic Central, 7 p.m.
No. 8 Yellow Springs vs. No. 6 Bradford, 8:30 p.m.
No. 1 Tri-Village vs. Newton-Miami Valley winner, 6 p.m.
East Dayton-Catholic Central winner vs. Yellow Springs-Bradford winner, 7:30 p.m.
No. 9 Miami Valley Christian vs. No. 2 Cedarville, 5:30 p.m.
No. 4 Fayetteville Perry vs. No. 8 Middletown Christian, 7 p.m.
No. 7 Cincinnati Christian vs. No. 6 Southeastern, 8:30 p.m.
No. 13 Felicity Franklin v.s Miami Valley Christian-Cedarville winner, 6 p.m.
Fayetteville Perry-Midd. Christian winner vs. Cinc. Christian-Southeastern winner, 7:30 p.m.
No. 6 Lehman Catholic vs. No. 3 Russia, 5 p.m.
No. 5 Houston vs. No. 2 Legacy Christian, 6:30 p.m.
No. 7 Botkins vs. Lehman-Russia winner, 2 p.m.
No. 8 Riverside vs. Houston-Legacy Christian winner, 3:30 p.m. Winner vs. Brookville 1 Bracket winner, Saturday, March 2, TBA at Troy HS. Compiled by John Bombatch. For a full listing of all the Southwest District tournament brackets, please visit ohsaa.org/SWDAB-Home .